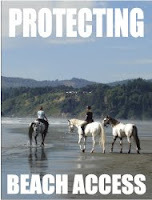 Open Beaches & Trails: State Parks: Having problems or causing problems? State Parks: Having problems or causing problems? We all love our state parks and most of us consider them the crown jewel of our state. However as Martha Walden (”Parks slashing more than budgets,” Times-Standard, June 21, Page A4) and others are pointing out there is an increasingly disturbing trend taking place that is desecrating state park habitats and degrading recreational opportunities in our North Coast district. I invite folks to take the time to walk the trails and look around the parking areas at Little River State Beach to form your own opinion about whether our nearly $1 million was well spent in a time of severe budget constraints. The implementation of the approved Little River Restoration and Enhancement Plan seems an attempt to stretch the definition of the word restoration. By all appearances California State Parks would like that definition to include wetland infilling by de-vegetated windblown dunes, degraded visual qualities, and several large full plastic bags still sitting along the trail. And let's not forget the erosion from the newly constructed parking areas that has been covered up by the limbs of a nearby butchered pine tree. The word enhancement should have been left out of the plan entirely. That definition cannot be stretched enough to include the serious safety problems along the horse trail, especially the recently installed $10,000 cable fence. Most folks refuse to ride there any more because of that hazard. Letters from several leaders in the horseman's community remain unanswered and concerns ignored. State Park's monitoring reports also show native plant recovery at approximately one eighth the rate of the non-native plants since the excavation of the project area . Reports also show no hatched plover chicks in the project area since the start of the project in 2006. Native vegetation including wax myrtles and spruce trees have been cut down in order to close-off wildlife pathways with dead trees and piles of native coyote bush. Numerous letters from the public have been sent to sector superintendent Mr. Bomke questioning these practices. I have been told on three occasions that they refuse to answer my questions related to these legitimate concerns. While State Parks recognizes the need for volunteers especially during this budget downturn, becoming one is a bit daunting. A 10-page legal document must be signed that includes several ways of saying that they can terminate your volunteer status at any time for any reason or none at all. Even though I work with an awesome group of volunteers, the process is not exactly inviting. Frankly it is rather insulting. By contrast the city of Arcata greets volunteers with coffee and bagels and a sign-in sheet. The group photo with new friends and old at the end of the day and sincere appreciation for a job well done has much more appeal. We have asked State Parks to conduct a public meeting to air these issues and hopefully help make the interaction between the citizens of California and State Parks more effective. Sadly that suggestion has been dismissed by Mr. Bomke as was a petition signed by 200 concerned citizens. Perhaps Kimberly Tays (”Walden's park concerns spot-on,” Times-Standard, June 22, Page A4) is right about the county rescuing our local state parks like at Grizzly Creek. The county is much more in tune with our community needs and doesn't feel so compelled to rush in like a bulldozer in a china shop. At least we might be greeted with signs that say welcome such as at other county parks rather than threatened by the State Parks signs that have a red line through traditional and healthy activities. We would also like to see people like Wade DeLashmutt (”Possible to ease clam bed access?”, Times-Standard, June 22, Page A4) who might be getting a little long in the tooth get a vehicle pass to access the clam beds at Clam Beach. State Parks will have to soften their stance somewhat for that to happen. The brand new State Park district superintendent Dana Jones has her work cut out for her if she is here to reestablish the once strong mutual support between State Parks and the citizens of the north coast. We will welcome a new approach to achieve that goal. 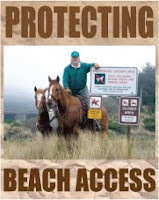 Uri Driscoll is vice president of Northern California Horsemen's Association and trail chair for California State Horsemen's Association region 13. He resides in Arcata.